A lot of (good) changes have happened in my life over the past few weeks. I have a new job. My first full-time job, which is pretty awesome. I’m in night school almost all week to get my grad degree. And, from all of these experiences and many more, I’m starting to gain a sense of independence. One of the reasons why I’m feeling more independent is because I am now (almost) completely responsible for buying my own groceries. For long as I can remember, I have been dependent on my parents to buy my groceries for me. This wasn’t always convenient. Sometimes they couldn’t get out to the grocery store when I needed food, and, most the time, I didn’t want the same groceries that they did. Over the past few weeks, I’ve actually been doing my weekly grocery shopping all by myself (yeah, I know I’m a late bloomer). Let me tell you, it really has made me feel like more of a real adult. I’m finally taking charge and putting my money where my mouth is, kind of literally. Weekly grocery shopping is definitely a lot more work than I thought it would be. It kind of hit me recently that food doesn’t last forever and that I really do have to go every week. With my busy schedule, it’s kind of hard sometimes to find time to go grocery shopping, but it’s something that I have to do. My favorite kind of food to shop for is produce. I absolutely love eating my fruits and veggies, and they easily fit into every single one of my weekly meals. Actually, my meals are mostly fruits and veggies at this point. While I can buy some food items that will last long periods of time like beans, soy milk, and pasta, produce is something that I definitely have to get on a week by week basis. In “Seven Staples to my Vegetarian Diet,” I talked about how obsessed I am with eggplant. Almost two years later, this is still very true. I buy an eggplant every week. I’ll feel a sense of loss if I don’t have a fresh eggplant to cook up for the week. 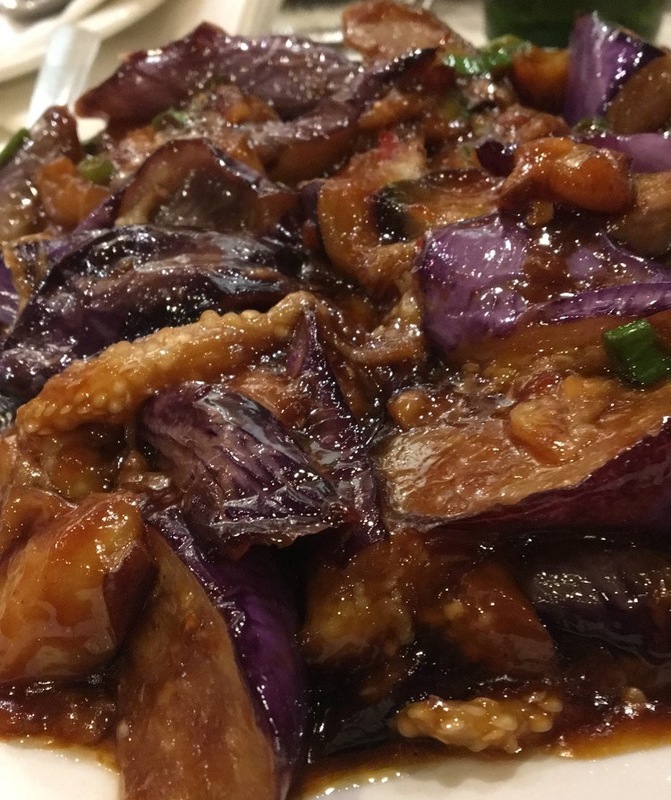 I love eggplant because it can be the main part of a dish, a simple side, or something to add into an already delicious dish. At the beginning of each week, I use a stove-top panini press to grill slices of eggplant. Throughout my week, I’ll use the slices of eggplant in salads, in pasta dishes, on the side of veggie burgers, or as part of any other meal I feel needs a bit of eggplant. I guess I’ve hopped onto the cauliflower bandwagon to some extent. I still prefer real pizza crust to cauliflower crust and eating mash potatoes over mashed cauliflower, but I like eating it in other ways. There’s nothing more delicious to me than a freshly roasted head of cauliflower with hummus oozing down the sides of it. 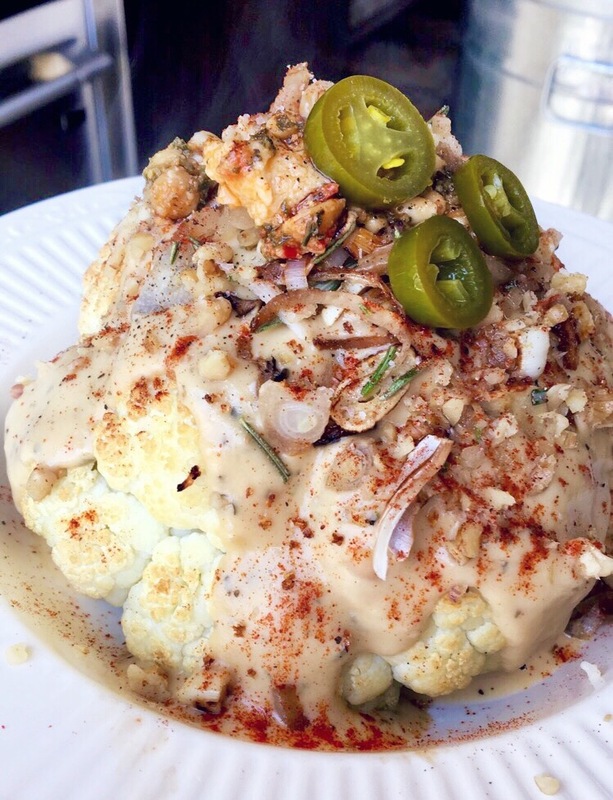 I also really love baked cauliflower covered in tahini sauce. Cauliflower rice is becoming one of my new obsessions. I love cauliflower because there are so many different things you can do with it. You can rice it, mash it, make it into steak, roast it – there are endless possibilities. 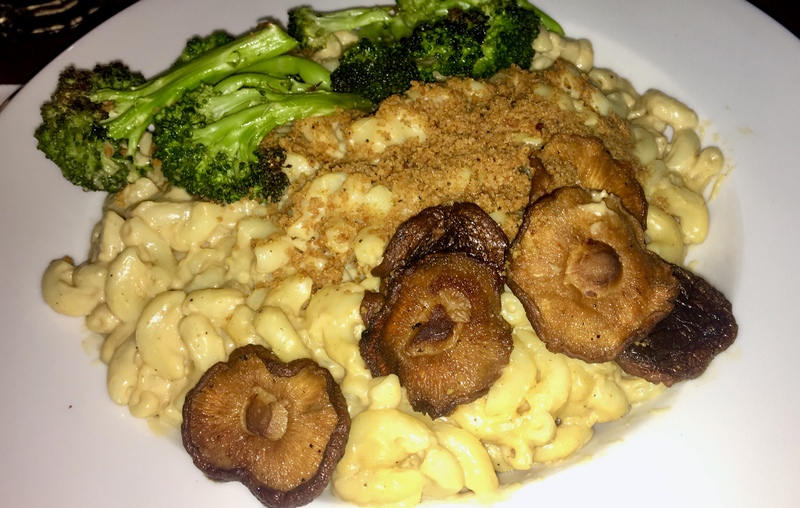 An easy lunch that Adam and I often eat is roasted cauliflower (a version of this by Adam is pictured below). Set your toaster oven to 350º. Put a washed head of cauliflower onto the toaster oven tray, lining the tray with tin foil. Add some of your favorite spices to the top of the cauliflower. Place it on the bottom rack of the toaster oven and bake for about 15-20 minutes, or until the cauliflower begins to brown. Let cool for 5 minutes and serve with a side of your favorite hummus. I’d say I’m about equally obsessed with apples and mangos. There was a point in my life (not too long ago, actually) when I would eat an apple every single day. Of course, I would incorporate some variety by eating different types of apples. My favorite apples are always the kinds that have reddish skin and a good balance of sweetness and tartness, like pink lady. Mangos are a more recent obsession of mine. I like their soft texture and sweet, juicy taste. Sometimes, I like adding fresh mangos and/or apples to my salads. Other times, I simply like to eat them raw. Mangos give fruit salads an exotic pop, while apples taste amazing with almond butter. I also enjoy apples in desserts. Apple pie is one of my favorite desserts, hands down, but I also like eating it in an apple bread or simply baked with cinnamon. I try to buy both of these fruits every week. If mangos aren’t in season, I buy a bag of frozen mango, which tastes just as good as the fresh fruit. One of my unpopular opinions is that mushrooms are amazing. I eat mushrooms every week – almost every day. They are low in calories, fat, and cholesterol. They have a number of vitamins including zinc and potassium, and they are high in antioxidants. (Read more about mushrooms here.) I mostly like mushrooms because of the texture. They have a soft, chewy, almost rubber-like texture that adds a surprising twist to most meals. There are also a number of different types of mushrooms that each have their own unique taste and texture. My favorite mushrooms right now are Baby Bella Mushrooms and Shiitake Mushrooms. I buy a package of mushrooms every week, and, like eggplant, I throw sautéed slices into my salads, pasta dishes, and other main entrees. It may seem like my weekly produce shopping list is very specific. It is, but there is more variety to it than you think. These few ingredients allow me to make a multiple of different meals with using different combinations of produce. Sometimes, I’ll spice up my produce selection getting potatoes, cucumbers, a different fruit, or something else. Having a set list of produce I buy each week makes grocery shopping easier. I know exactly what I need when I get into the store. With such a busy week, having a more simplified shopping list helps me save time and energy. What are your produce essentials, my Dolls? To get a more in-depth look at the world of The Porcelain Doll, be sure to follow me on Instagram, Twitter, and Pinterest. Also, check out my Facebook page, YouTube channel, and poetry blog. Blast from the Past, The Jonas Brothers Are BACK!